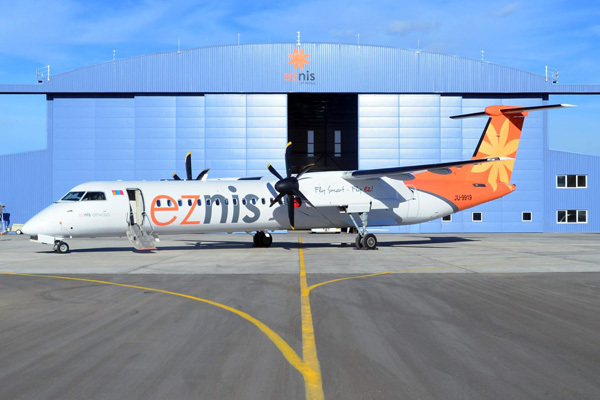 Eznis Airways (Ulaanbaatar) suspended operations on May 22. The airline blamed the stoppage on “financial difficulties”. The company at the end was using two Bombardier DHC-8-402s (Q400s) and one SAAB 340B. Eznis was operating from its Ulaanbaatar base mainly to Choibalsan, Moron, Ulaangom, and Ulgi in Mongolia at the end. We thank everyone who chose our airline, our regular passengers, our partners and our suppliers, for cooperation and support. The management of the company and the shareholders had done everything during the last two years to survive, to keep positions of our employees and most importantly, to serve the public, but they cannot subsidize the financial losses any longer. We bring our apologies for all our customers, passengers, employees, engineers, flight operation staff and the crew. Copyright Photos: Eznis Airways. Top: Bombardier DHC-8-402 (Q400) YU-9919 (msn 4106) sits outside the Eznis hangar. Below: The two Q400s (JU-9917 and JU-9919) at the snowbound Chinggis Khan International Airport base. This entry was posted in Eznis Airways and tagged 4106, Bombardier, Bombardier DHC-8, Bombardier DHC-8-400, Bombardier Q400, DHC-8, DHC-8-400, DHC-8-402, Eznis Airways, Eznis Airways LLC, JU-9919, Q400, Ulaanbaatar on May 24, 2014 by Bruce Drum.